Home > Hinduism > Hindu rituals > Shradh – An opportunity to repay debt to our ancestors > What is Shradh ? The term ‘Shradh or Shraddha’ (Special rites performed for the departed ancestors) conjures up an incorrect impression, one of unscientific and ostentatious ritualistic activity, in the minds of the younger generation belonging to the modern scientific age. 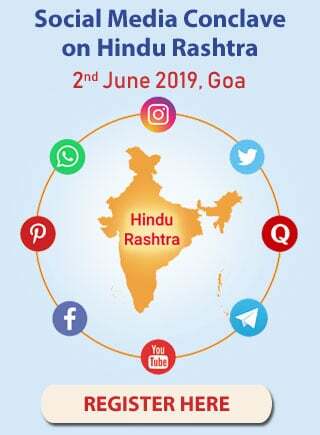 This is the result of absence of any formal education on Dharma (Righteousness), indifference towards understanding Spirituality, influence of western culture, anti-Dharma organisations targeting traditions and customs in Hindu Dharma with a continuous barrage of hate-filled criticism. A line of thinking, as given ahead, is also prevalent in the society about shradh. People, who lack faith in ritualistic worship or shradh, and consider social service superior, have very naive views. They say that instead of performing shradh for the pitars, they would rather donate food to the poor or provide help to schools ! And, many of these people do actually put their views into practice. This is as absurd as saying, ‘Instead of performing surgery to treat a particular disease, we will donate food to the poor or provide help to schools’. Since the spiritually potent mantras recited during the shradh rites have the subtle power of providing momentum to the subtle-bodies of pitars, they can progress to a higher subtle-region of existence after the rites have been performed. This reveals the folly in the above mentioned views. 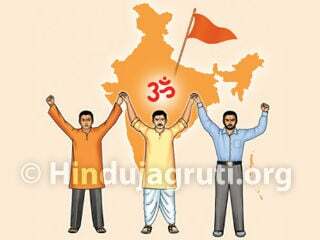 Therefore, the objective of this series of articles is to remove the veil of ignorance and blind-faith of the people who maintain this line of thinking, and to change their thinking so that they develop a positive and spiritual perspective towards the sacred shradh rites prescribed by Hindu Dharma. Bharatiya culture says that, just as we serve our parents and close relatives when they are alive as part of abiding by our Dharma, we have certain duties unto them after their death. The shradh rites provide us with an excellent opportunity to fulfil these duties and repay our debts unto the pitars. The shradh rites are necessary so that the journey after death of our parents, who have taken our utmost care during our childhood, becomes comfortable and without any distress, and that they acquire sadgati (Momentum for moving to the next higher region). If shradh is not performed, the desires of the pitars (Deceased ancestors) remain unfulfilled. Negative energies make easy victims of such desire-riddled pitars and then, enslave them. In all likelihood, they then use them to cause distress to their own family members. By performing shradh, we get relieved from the distress caused by the pitars, and our life on earth becomes comfortable. The word ‘shradh’ has originated from ‘shraddha’ (Faith). It is just impossible to repay all that our deceased forefathers have done for us. The rites that are performed for them with complete faith is known as shradh. Meaning : The offerings (food etc.) made with complete faith and accompanied by all the rites to the Brahmans as representatives of the pitars after pronouncing the place, time and appropriate venue is termed as shradh. 2 A. The first propounder of the shradh rites is Sage Atri, the son of Deity Brahma. Sage Atri narrated to His descendant Nimi the shradh rites as laid down by Deity Brahma. Subsequently, they became traditional achars (Conducts) and continue even today. 2 B. Manu was the first to perform the shradh rites. Hence, He is called the Deity of shradh. 2 C. After Shriram, Janaki and Lakshman were banished to the forest, Bharat went to meet them, and told them about their father’s death. Thereafter, Shriram performed the shradh rites for His departed father. There is a mention to this effect in the Holy text Ramayana. During the period of Rugveda, pitars were worshipped by offering samidha (Wooden sticks,) and pinda (Rice balls used during shradh) into the sacrificial fire. The process for pindadan finds a mention in the Holy scriptures of Yajurveda, Bramhans, Shrout and Gruhyasutra. This rite was put into practice during the period of Gruhyasutra. Information on the period when the Pindapuja commenced is documented in the Holy text Mahabharat – Varahadev, the Incarnation of Shrivishnu, introduced the entire concept of shradh to the world. He created three pindas from His molar tooth and placed them on darbha (A type of grass used in rites and rituals involving sacrificial fires and rites for the departed souls such as shradh) placed in the southern direction. Varahadev then advised, ‘Let the 3 pindas be considered to represent the father, the grandfather and the great-grandfather’. He then performed the ritualistic worship of the pindas using sesame seeds as mentioned in the scriptures, and then suddenly vanished. 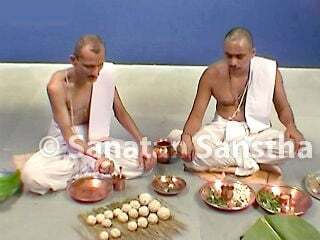 Thus began the worship of pinda for the pitars as per the guidance of Varahadev. During the post-Gruhyasutra and Shruti-Smruti period, offering food to Brahmans (Priests) was considered mandatory and became an important part of shradh rites. In the current era, all the three stages mentioned above are included within the Parvana shradh. The scriptures prescribe that the householders should perform the shradh rites as their duty. When an individual dies, upon performing the shradh rites his/her subtle-body gets freed from the pretayoni (Species of the dead), and it gets position in the subtle-region called Pitrulok. Only then it assumes the status of a pitar. After performing Sapindikarana shradh (Shradh performed a day before the first death anniversary of the individual), the soul that has assumed the state of pitar now joins other pitars and then gets further categorised as parvana. He becomes eligible for receiving Parvana shradh. This shradh is addressed to the past three generations of the pitars. The annual shradh, 96 shradhs such as the ones performed on the new-moon days, and Mahalaya shradh are the shradhs that are categorised as Parvana shradh. Under normal circumstances, shradh for the deceased individual is performed by his/her son. In his absence, other options are explored. The entire terminology of shradh centres around the son as the performer of the shradh. Therefore, the soul of the deceased individual for whom the shradh is being performed, is refered to as ‘pita’ (As father of the performer). A generation earlier, that is, the father of the deceased individual is referred to as ‘pitamaha’ (Grandfather of the performer). The grandfather of the deceased individual is referred to as ‘prapitamaha’ (Great-grandfather of the performer). The generations earlier than these are not taken into account in the Pitrutrayi, because it is assumed that they have been liberated. Jivapitruk is a son whose father is alive. He does not have the right to perform Pitru shradh; but has the right to perform shradh of the grandfather (mother’s father) and his mother. So also, generally speaking, a jivapitruk does not have the right to perform rites of Narayana-nagbali, Tripindi shradh, etc; however, if these rites are performed with the objective of conceiving a child, then the jivapitruk has the right to perform them. Since the objective of the rites such as Narayana-nagbali is to eliminate the distress caused by the dissatisfied subtle-bodies, it is noticed that at some places, the right to perform this rite has been given to the unmarried jivapitruk also. Janeu should always be worn on the left shoulder. This style of wearing is termed as ‘savya’. When worn on the right shoulder, it is known as ‘apasavya’. When worn like a necklace, it is known as ‘nivit’. During the shradh rites, the Deities and the pitars are offered a darbha each and invited. This is termed as offering ‘kshan’. Rangoli drawn using ash amidst chanting of mantras, around the leaf (on which a meal is served) arranged for a Brahman is called pishangi. 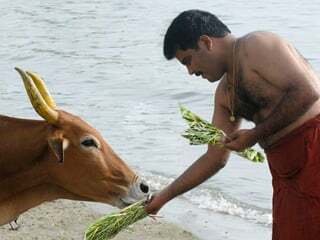 (In the shradh rites, offering food to a Brahman is considered an important aspect.) Rangoli is drawn in a clockwise direction (similar to a circumambulation) around the leaf arranged for the Deity, and in the reverse direction around the leaf arranged for the pitars. 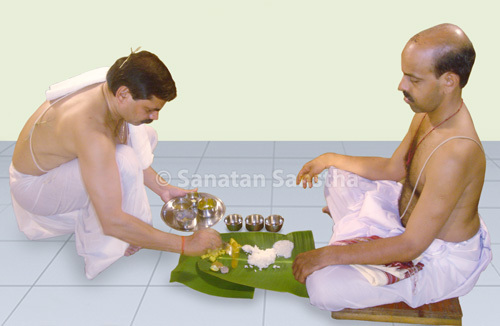 During shradh, upon completion of pindadan and worship of the pinda, in a state of savya small quantitiy of cooked rice is offered in front of leaf of the meal for the Deity. This is known as vikir. 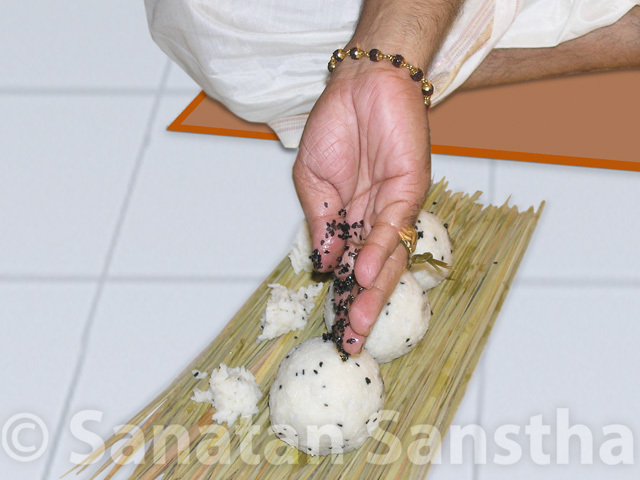 After vikir, in apasavya state small quantity of rice is offered in front of the leaf of the meal for the pitars. This is known as prakir. After prakir, a pinda is offered near the leaf of food arranged for the pitars or close to other pindas, for those who have died by getting burnt in a fire or due to partial burning or for the dead foetus, and it is termed as ucchista pinda. A sacred text of Hindus that contains formulas to be recited by the officiating priest. 1. Subtle-body, 2. The human body as a replica of the macrocosm.